Posted on Jun 26, 2018 by WHC Bassetti. 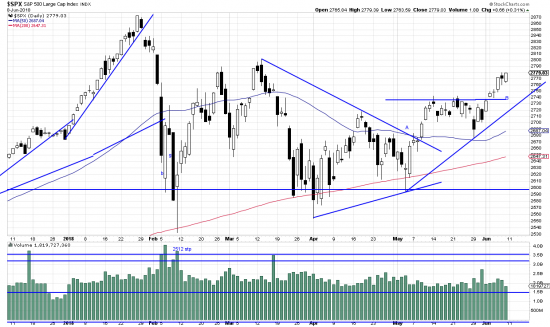 More of the same: this market is still in thrall to the events of February: 2872 at the top and 2580 at the bottom. Within this context we have just seen two up wavelets. The latter of these has just ended, as indicated by the trendline, followed by, for emphasis, by a power bar down and a gap. As these are short term phenomena it means we are in a down wavelet, duration and strength unknown, but probably constrained by the range. Swing traders will undoubtedly be short, and long term invesors will be gritting their teeth and staying long. Posted on Jun 09, 2018 by WHC Bassetti. 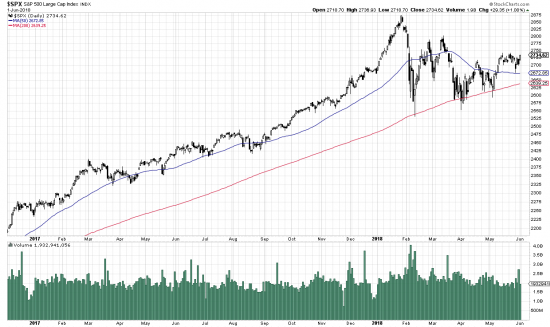 We recently said that only the bold would be in to this volatility plagued market. Then we looked at the chart again. 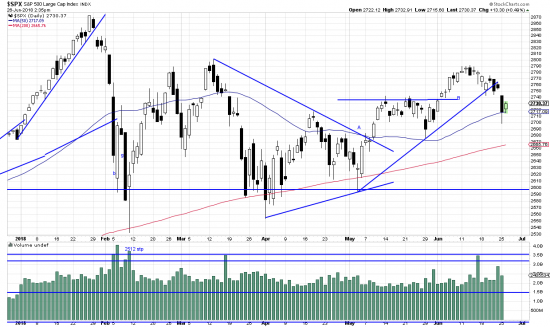 There is a breakout (A) from a triangle and a breakout from a congestion area (B) with good volume patterns. So we said to ourselves if volatility causes equity swings we’ll just grin and bear it. Posted on Jun 01, 2018 by WHC Bassetti. Here’s how we got here. Rarely have we seen a formation that is more difficult to draw conclusions from. We can analyze it without great difficulty. There is first of all the last (so far) wave of the great 09-18 bull market. This is topped off by a semi-parabolic wavelet followed by the waterfall of prices. This doesn’t look like a top, It’s hardly a down wave. The awkward nomenclature system calls it a “correction”–which amounts to –high to low, 11%. Percipitous falls are quite common after spike events like this.